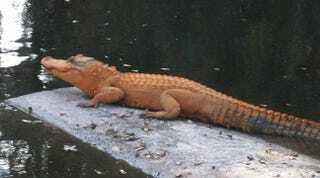 A woman in Florida spotted the world's first orange alligator, and helpfully took a picture. As far as biologists can tell, it's colored that way because it's 'half albino'. Check out the story at Tree Hugger.